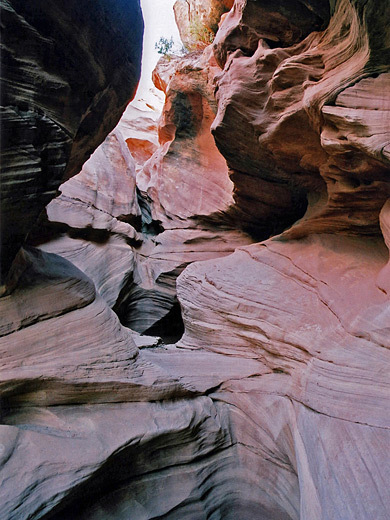 Another major tributary of White Canyon, Fortknocker has many short sections of beautiful narrow passageways, eroded through rocks of varying shades of red, pink and grey, often containing thin wide bands that form subtle, wavy patterns in the canyon walls. The drainage has a few dryfalls and some potholes that may fill with water to depths of several meters in wet weather, but only one significant obstruction, a narrow slot emptying into a deep pool shortly before the junction with White Canyon, at which point the cliffs are sheer and up to 400 feet high. 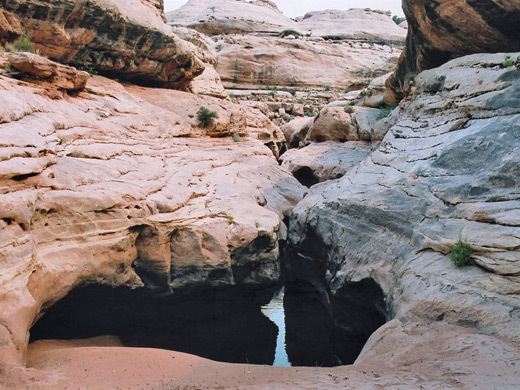 Because of this, Fortknocker is not easily entered from the west, starting from the well travelled highway UT 95, and instead is best reached from unpaved, unsignposted tracks on the east side, which makes the canyon little visited and quite unspoilt. Fortknocker joins White one mile east of UT 95 between mileposts 59 and 60, about 4 miles south of the Black Hole. 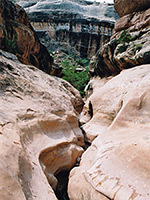 Although the lower end can be reached by hiking along White Canyon downstream from the Horse Tanks Road crossing (mile 61 of UT 95) or upstream from one of several entry points to the north, the recommended route, to the top end, is to take Rec. Road 632 which forks east off UT 95 near milepost 49, not far from the turning to Hite. This is generally a good route, just a little steep and bumpy over the first couple of miles, where it crosses uneven terrain of small cliffs and ravines, before levelling out once it meets the vast flat plateau of Cedar Mesa sandstone which surrounds all of the White Canyon drainage. 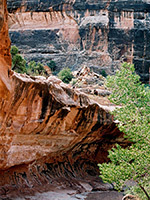 The road then runs beneath the northeast side of Browns Rim, a string of isolated mesas of Wingate sandstone, and eventually enters the Dark Canyon Primitive Area. Fortknocker is reached by one of two side tracks to the south, beginning 7 and 8 miles from UT 95 - these run around either side of a pair of high buttes then later converge, going on to cross the very upper ends of two forks of the canyon, another 1 to 1.5 miles after the junction. 25 views of Fortknocker Canyon. TopoQuest topographic map of Fortknocker Canyon. 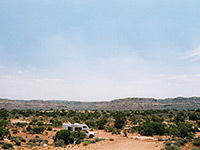 The first (north) fork is as good a place as any to start, and there are plenty of fine parking/camping places on the level slickrock plateau beside the canyon, which south of the track soon becomes a few meters deep with a flat floor bordered by typical Cedar Mesa sandstone strata at either side. Some shallow narrows and a few small dryfalls are followed, after 15 minutes walking, by a deeper, 2-stage drop. 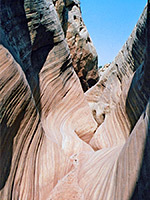 First is a short, twisting slot that empties into a reddish, bowl-shaped chamber eroded into many thin strata, and containing a large pool in times of rain. Just beyond, a deep, narrow crack also leads into a pothole, flooded to depths of 15 feet after rainfall but easily passed if dry. Both obstructions could be avoided by climbing around and re-entering the canyon below where, after another short stretch of narrow channels, the ravine opens out a bit and meets the right (main) fork. Upstream along here is a longer slot, though still rather shallow, that has especially crisp passages carved through pinkish grey rocks containing many thin, wavy strata, ending beneath a fall of 10 feet towards the far end, where the main canyon becomes noticeably less deep. 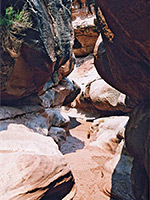 Proceeding downstream of the junction, Fortknocker passes through a series of medium width slots that gradually widen, so that the middle of the canyon is rather wide, its floor a mixture of level, rippled terraces, sandy areas, chokestones and occasional dryfalls. A small tributary joins from the left then another from the right, by which point the canyon is around 50 yards across. A bigger dryfall of 40 feet, easily passed by climbing down benches on the right side, marks the beginning of the lower narrows, again all very pretty despite never being particularly deep or enclosed. Various large potholes harbor water even in the driest spells so the canyon will be quite watery and muddy during rains. There are also several other wide dryfalls up to 15 feet high, all easily climbed. The end of this section is marked by a more entrenched passage - a very narrow channel of interlinked flooded potholes, finishing with a drop of 3 feet into a pool of unknown depth, beyond which the narrows end abruptly and the junction with White Canyon is reached soon afterwards. Another tributary joins just after this last slot, flowing over a wide, curved, overhanging cliff face covered by colorful streaks of desert varnish. All the lower part of Fortknocker Canyon is deep and mostly sheer sided, so there are few if any entry/exit points after about half way. This area has a distinct feeling of isolation and is completely undisturbed, despite being quite close to the busy UT 95.